Beautiful soft premium leather short sleeved shirt. Fitted leather shirt with snap front, breast pockets and snap down collar. 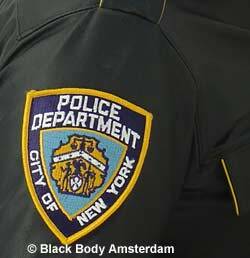 Features official New York police badges on each arm and matching yellow piping on pockets, collar and epaulets. We have leather ties available. Click on more details to order them. Click on the picture to view the back and a detailed picture of the badges.